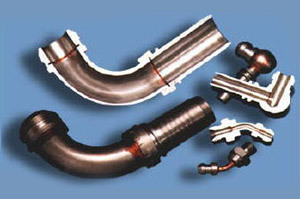 Vacuum brazing offers flux free joints of the highest integrity, strength and cleanliness. 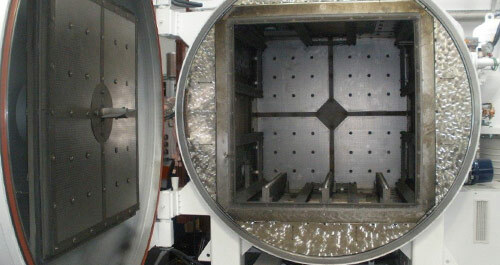 Vacuum brazing is used for joining a wide range of alloys and complex shapes & sizes and can often incorporate a subsequent heat treatment process. 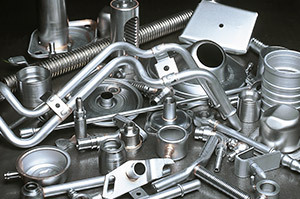 Vacuum brazing also offers the widest choice of brazing alloys and properties. 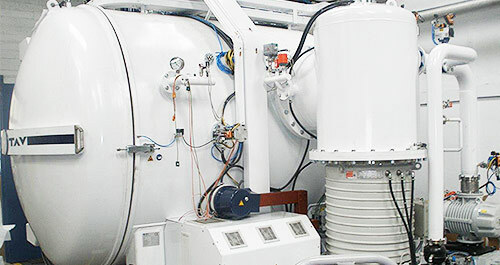 Vacuum brazing offers slow heating and cooling rates which can reduce internal stresses, which in turn can give improved thermal and mechanical properties of the materials being brazed. Often referred to as Bright Brazing, Copper Brazing, Continuous Brazing, Atmosphere Brazing. An ideal process for very low to very high volume parts in steel or stainless steel. Carried out under a reducing furnace atmosphere resulting in a clean component & one requiring no post braze cleaning. Hydrogen Brazing uses the strongly reducing characteristics of hydrogen to clean/reduce the oxides that are usually present on the mating surfaces of most materials being brazed. This in turn aids the wetting/bonding of the brazing alloy being used which can increase the strength of the brazed joint. 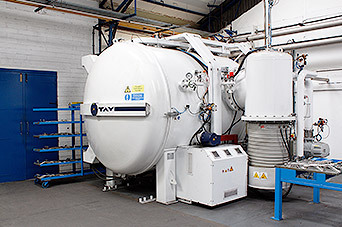 Hydrogen Brazing (especially in a humpback furnace) gives exceptional results on most stainless steels but it cannot be used for brazing titanium alloys. Cleanliness - Hydrogen Brazing reduces surface oxides on the parent material which improves the cleanliness and integrity of the brazed joint. 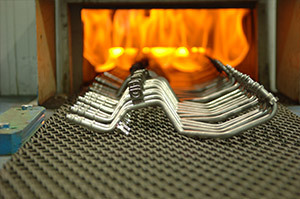 Flexibility - Hydrogen Brazing increases the braze alloy material options - i.e. it enables the use of high vapour pressure braze alloys that cannot be brazed in a vacuum atmosphere. Material Choice - Hydrogen Brazing can be applied to a multitude of materials such as stainless steel, copper and certain nickel based alloys. Hydrogen Brazing can give exceptional brazing results when carried out using a humpback furnace. A flow of pure dry hydrogen continually refreshes the furnace atmosphere which helps to reduce surface oxides & other possible contamination on the assemblies to be hydrogen brazed. This in turn improves the wetting characteristics of the braze alloys. Kepston use furnace atmospheres that permit the brazing of multi-jointed components in mild steel and/or Stainless Steel without the use of flux. Copper Brazing, Bright Brazing, Mesh Belt Brazing & Atmosphere Brazing. Components should be clean, free from swarf, rust and excess grease before brazing. It should be noted that score marks, shot blasted or roughened areas in the region of the brazed joint will pull the braze filler metal away from the joint. Due to the high melting point of the braze material [1083ºC for Copper] most commonly used hardening and case hardening heat treatments can be carried out after brazing. Also most plating processes take well on copper brazed components. A uniformed heating & cooling rate can reduce the potential for distortion. Joint strengths greater than the parent metal are possible. Parent metals are not fused or damaged. Stresses are relieved during brazing. No surface deterioration takes place during the process. Dissimilar metals can be brazed together. Different metal thickness are permissible in brazed joints. Multiple joints can be brazed at once. Long and inaccessible joints can be filled successfully. Skilled labour is not required to carry out the process. Rapid reproducible results are obtainable. Close fits are necessary to facilitate the capillary action. Component parts will be annealed during the process. Provision for location of the brazing material has to be allowed for in the design.